Pastors Johannes Lilje and son-in-law Louis Reibeling. Johannes Lilje (1833-1920) and Christoph Lilje (1839-1912) were brothers born in the village of Gerdau, in the area of northern Hannover known as the Lüneburger Heide. Their parents were poor peasants often called Brinkkötner. These were cottagers living on the edge of the village ... we'd say on the wrong side of the tracks ... with no land other than a kitchen garden. The house, once occupied by the parents of their mother Anna Margarethe Carstens, was likely only a couple of rooms. Without sufficient land to feed his family, their father, Joachim Heinrich Lilje, worked as a day laborer in the village ... probably a farm hand or servant. Even that meager life did not last long. Both parents died, only about a year apart, leaving a teen-aged girl and four little boys as orphans. Fortunately, their community rallied around them and provided homes, education, and encouraged a strong Christian faith. This community support was likely the reason the lives of Johannes and Christoph evolved into such great examples of Christian life, faith, and service in distant lands. The Lilje brothers had an opportunity not open to many peasant children in 19th century Germany. They both attended the nearby seminary in Hermannsburg, which prepared the sons of poor farmers to be foreign missionaries. Click here to learn more about the Hermmansburg Mission Society and its . Johannes graduated from the Hermannsburg Seminary in 1867. was ordained, and went to Natal in South Africa to serve as a missionary to the Zulu people of that area. Christoph did not complete the Hermannsburg program, but rather emigrated to America where he completed a traditional Lutheran seminary education at Capital University in Columbus, Ohio. He was ordained, and then served the many German-speaking immigrants to the U.S. Two ophaned brothers, both now Lutheran pastors, but serving in very different worlds. That's where this story really begins. Pastors Christoph Lilje and son Otto J. Lilje. In 1867, Johannes Lilje sailed on the brig Kandize for Natal to work on behalf of the Hermannsburg Missionary Society in bringing the message of Christianity to the Zulu people. The South Africa he found was populated largely by native tribes, but was looking forward to decades of war, racial and ethnic strife, and the greed engendered by gold and diamond discoveries. In his early years, as an assistant at mission stations in south Natal, his carpentry skills were more important than his preaching skills. But, he began to learn the problems of trying change the entire cultural heritage of a people. When he was ready to establish his own mission station, he brought Caroline Beckröge to Africa to be his wife. They established the Ebenezer station and operated it together for seventeen years. Nine of their ten children were born there. Johannes' reports show a few hard-won victories, but also note deep frustration with the frequent reversion of his "converts" to their pre-Christian ways. In 1888, Ebenezer was closed and Johannes was assigned as pastor to the German congregation in Neu Hermannsburg. There, until his retirement in 1906, he served both the Zulu and German congregations as both preacher and teacher. He was elected to the Mission Advisory Board. Following retirement, he voluntarily continued teaching and assisting there until his 80th birthday. Though he often viewed his efforts on behalf of the "heathen" as failures, in his later years Johannes was truly seen by his colleagues as the embodiment of Christian faith and fortitude in a difficult environment. Louis Reibeling (1872-1932) was born in Natal. His father, Johannes, was a missionary who came to South Africa with Lilje. Louis was brought up on mission stations, and early-on displayed great facility with languages. As a youth fluent in Zulu, he assisted his father in teaching the native evangelists. In 1897, he went to Germany to study at Hermannsburg and be ordained. Soon after his return, he married Auguste Lilje. In 1911, he took over his father's Ehlanzeni Station and had considerable success there. But, his true passion was his scholarly pursuits, especially being part of the team translating the Bible into Zulu. Unfortunately, he did not live to see the completion of this project. Chief Mavele's Kraal (fortified village) in 1879. 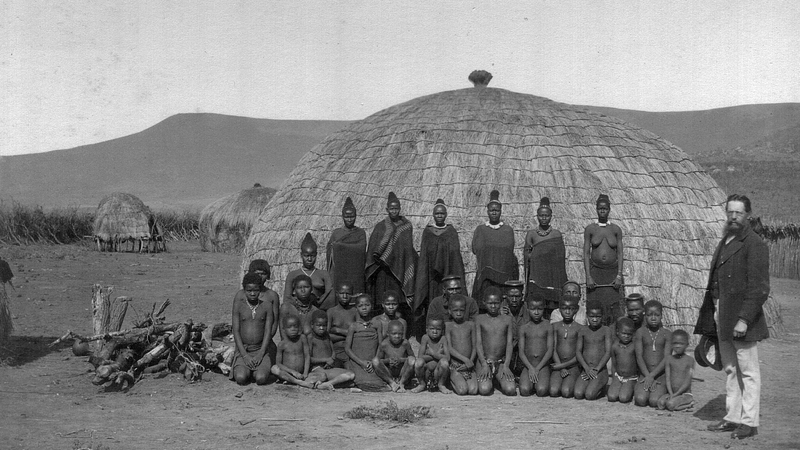 Shown is Pastor Johannes Reibeling with the chief's wives and children. In 1872, Christoph Lilje sailed on the maiden voyage of the steamship Frisia for America to complete his education. By this time, Ohio's native population had been forced West, and the state was largely productive farmland experiencing the beginnings of industrialization. Many of the farmers were recent immigrants who believed preservation of their Lutheran faith depended on maintaining their German language and culture. After completing seminary, Christoph was assigned as vicar at Peace Lutheran Church in Galion. There, due to the illness of the pastor, he led the congregation and oversaw a building program. His ability was noticed and the Synod President gave him the task of building a mission congregation among Germans ... and so began a hectic and productive decade in Port Clinton. Meetings in homes, services at a union church, marrying Eva Bühner of Galion, teaching Confirmation classes, purchasing a lot, building a sanctuary, legal issues of forming a congregation, accepting a formal call, the birth of three children, and years of service as first pastor of St. John ... all at $300 a year. In 1886, Christoph accepted a call to a rural congregation in Salem Township, near Oak Harbor, where he served until his death in 1912 as pastor and the only teacher of the parochial school. His official acts were 746 baptisms, 419 confirmations, 246 marriages, and 290 funerals ... with preaching and teaching always in German. His obituary described him as "a kind, faithful and Christian husband and father; a faithful servant of his church; in his life and demands, humble and modest." Otto J. Lilje (1876-1958) was born in Port Clinton, and brought up as a PK (pastor's kid) in rural Salem Township, Ohio. He attended Capital University, both undergraduate and seminary. Otto was ordained by his father, married Doretta Wodrich from his father's congregation, and began his ministry in Fredonia Township, Michigan. In 1906 he accepted a call to a rural Ohio congregation in Latcha. There he served with distinction for almost a half-century. He left a fully Americanized congregation to "retire" into the chaplaincy at Ohio's Luther Home of Mercy. He is fondly remembered for raising a large family as a single-father, after the early loss of his beloved wife. Port Clinton, Ohio in 1879. Note the prominence of the telegraph pole.